With 12 weeks until race day, the Missoula Marathon announced that it will add Olympic Trials qualifying bonuses to the prize money available at the 2019 Missoula Marathon and Half Marathon. In addition to the $10,000 prize purse and performance bonuses, athletes achieving the “A” or “B” qualifying standards for the 2020 USA Track & Field Olympic Marathon Trials will receive a $500 bonus payment. Athletes interested in being part of the Missoula Marathon or Half Marathon elite fields can contact the event’s elite athlete coordinator at mosbachers@gmail.com. More information about the Missoula Marathon prize money (and more) can be found at www.missoulamarathon.org. About the Missoula Marathon: Located in the beautiful Big Sky Country of western Montana, the Missoula Marathon and Half Marathon take place on flat and fast courses. Runners can expect cool mornings with low humidity – ideal racing conditions. The Missoula Marathon was ranked as the #1 Marathon by The BibRave 100 for 2017 and 2018, while the Half Marathon was named a Top 20 Half Marathon in 2018. Runner’s World named the Missoula Marathon as a Top 10 Bucket List race in both 2018 and 2019. The race weekend is the signature event of Run Wild Missoula. 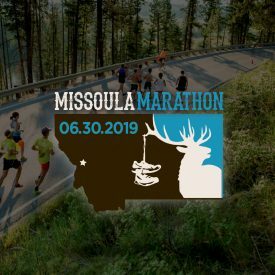 The 2019 Missoula Marathon and Half Marathon will take place on Sunday, June 30th, 2019. General inquiries about the Missoula Marathon can be sent to race director Tony Banovich at tonyb@runwildmissoula.org.